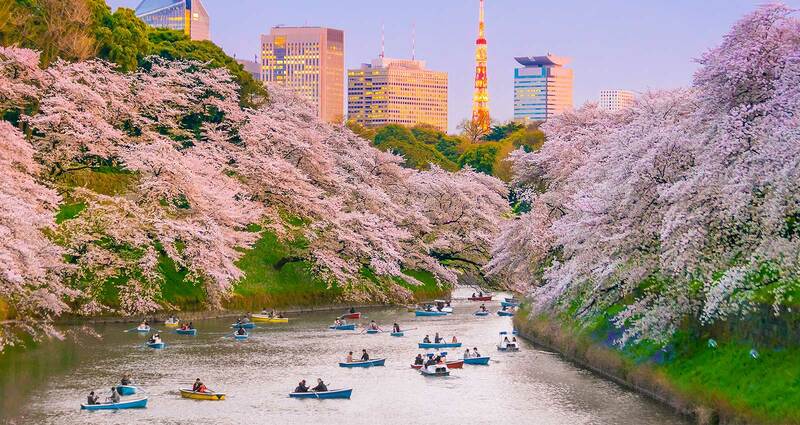 Today in Japan, during Hanami Festival, thousands of people gather in parks to picnic under the fragrant flowering trees. As the pretty pink blossoms fall, people savour cherry blossom inspired sweets like Hanami Dango—dumplings in three different colours—pink, white and green that symbolise the change of the seasons. Barbecues are also popular, as well as chirashi sushi, matcha tea and a host of other yummy snacks. Sometimes, the festivities go late into the night and become a yozakura or night sakura. At night, the cherry blossoms evoke a different kind of idyllic atmosphere. They sparkle beautifully under street lights and are decorated with traditional Japanese lanterns. During a yozakura, people enjoy viewing the pretty blossoms while sipping sake.